New Glasgow Public Library "Home of the Pictou County Roots Society"
One of our largest branches, and located downtown on the corner of Archimedes & Dalhousie streets, next door to the Fire Station. We offer a full range of free services and access to the resources of all Nova Scotia public libraries. 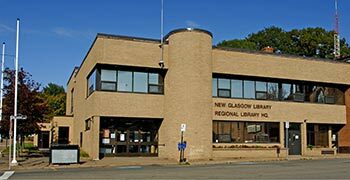 New Glasgow Library is also a Community Access Program (CAP) site, sponsored by Nova Scotia Economic and Rural Development and Tourism. At the New Glasgow Library you can access a wireless hotspot to high speed Internet. All library programs are offered free of charge. Please call the Library for more information 902-752-8233. Regular library programs are offered through the fall until the spring (from September to June). In addition to regular library programs and events join us for workshops, presentations and evening seminars on a variety of topics. Some of our special programs include, Summer Reading Clubs for kids, numerous Author Readings and book signings. New Glasgow Library holds a large history collection specializing in Pictou County - such as the Ritchie Cemetery Records (index to cemeteries in the County), local newspapers on microfilm, census records, community histories, family genealogies, and many other items of genealogical and historical interest. Drop in to the Heritage Room to see these unique holdings. Several of these resources are being digitized and are viewable at NovaStory.ca. Our staff are trained to help you choose and locate the information you require and assist with research. Need help? The Pictou-Antigonish Regional Library Board will provide non-profit groups with meeting space free of charge in the Community Room, when not in use for library activities. These meetings are to be of a non-fund raising, non-revenue generating nature. The Board reserves the right to accept or reject requests for the use of meeting space. View Program Room usage guidelines. New Glasgow Library also has a community office available for use as well as public art display areas. Bring your projects to life! Make a three-dimensional solid object of virtually any shape from a digital model. New Glasgow Library is the holder of a unique collection of Pictou County historical and genealogical information. An after hours bookdrop is available at the Library entrance. Find out what's happening at the New Glasgow Library this month.